During his time as U.S. Attorney General under President George Bush, Alberto Gonzales along with other legal eagles from the White House and Justice Department set out on a quest to redefine prisoner treatment and wiretapping after the 9/11 attacks. Gonzales wrote a confidential memo to Bush, which mysteriously made its way to the press, outlining ways to hold detainees without the protection of international law. He described "inhuman treatment" in the Geneva Conventions as vague and undefined. Gonzales and his band of renegade attorney's pushed international law as far as they possibly could to see how much they can get away with. Gonzales was Bush's old buddy from Texas who eventually would replace John Ashcroft as U.S. Attorney General in 2005. In 2007, he was called to testify in front of the Senate Judiciary Committee to explain the dismissal of seven Department of Justice attorneys. 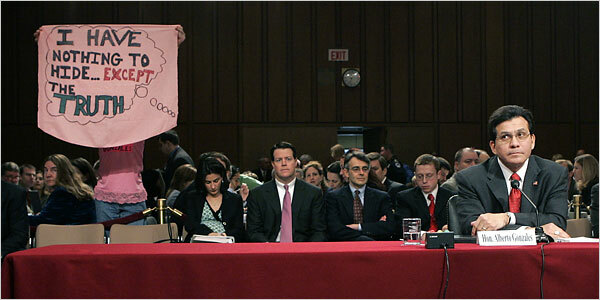 During his absent-minded comments to the Senate, CODEPINK activist Midge Potts took advantage of the situation and unfurled a banner behind the U.S. Attorney General which was captured by a New York Times photographer. In 2009, Spanish prosecutors were pressing forward in a criminal investigation targeting Alberto Gonzales, John Yoo, Jay Bybee, Douglas Feith, William Haynes, and David Addington over their role in the torture of five Spanish citizens held at Guantánamo. Gonzales and other senior Bush administration officials still have not been held accountable for their roles in torture, wiretapping and forcing the U.S. into an unlawful war on Iraq. Currently, Gonzales lives a life of luxury as a political science instructor at Texas Tech in Lubbock, Texas.